what to take on a scooter trip.. Discussion in 'Battle Scooters' started by damasovi, Nov 8, 2018.
flat tire kit, (it is tubeless), tools and mmm that is all. Of course it will be service the scooter before leaving. what else should I be carring? Pump to inflate the tire if you need to use the tire kit, credit card. What size scooter and how far is Trip ? Definitely everything to fix a flat tire, maybe one of those micro jump starters if it is EFI or has no kickstarter, maybe even a spare belt if it can be changed on the road. I carry a spare belt and tools to change it on my Vespa GT200. A cell phone and road service plan if they are available in Baja. I was on a week long trip to Ans around Smoky Mountains of about 2000 miles and in the photo is what I took. But I was on a 650cc Maxi Scooter. Loose items were under my seat - cover, tool kit, flat repair kit, battery jumper, MacBook, external hard drives, camera mounts, diagnostic tool for BMW, chargers for camera and gear at hotel. In one side case was raingear, extra riding gear, first aid kit, spare gloves, extra face shield (clear). In other side case was GoPros and drone, photo camera and spare batteries, maybe other electronics (I seem to be camera/video guy for our group). In top case was some food and drinks, street clothes that were easily accessible, a bunch of odds and ends and room to put items when stopped. In drybag on rear seat was cloth, shoes and non riding gear for trip. Probably more than I needed but I usually overpack and I had the room and ability to carry it all. You will be more limited by size and horsepower. Tear down your scoot to the belt (no need to pull it, but wouldn't hurt). Put it back together. Not what wrenches and such you really needed to do the job. Take off both wheels and note what you needed for that. Take a look at the calipers make sure the wrenches to remove those are included in your kit. This'll take you an hour or so but you'll know what ya need and know your bike a lot better. Source some extra tires and add the phone number for your source to your kit just in case you really destroy one. Add some ride-on in the tires, a patch kit & a spare belt & you're about as good as you'll get. Maybe a gas can or at least a small bottle. An extra 20 miles can be a wonderful thing. Odds are great this is overkill, but if nothing else it'll give ya something to do while waiting for help. @JerryH, Thanks, and yes a cell phone is what I think is a daily item, such as a wallet (and the carger), there is no AAA here, so no plans and for some parts of the peninsula, there is not even cell coverage, but people fill in the blanks. @Tromper with the a range on this scooter of under 150 miles, I need a 2 gallon tank, so I will be filling up since there are a couple of sections where you will not find gas stations in 150, 200 and a one 300 mile section. So yes, extra gas is need it. Maybe a siphon hose so if a kind passersby will let you take some gas from their tank into your gas can. Assuming the new scoots had enough trial runs to know it's good to go, the main thing is, as stated above tire flat stuff. My MC pump is a Slime that will easily pump a scooter tire. Rope plugs are best but require a high quality insertion tool that will handle the push-in. Sharp blade to cut off excess. Helps to have cement for insertion and a better, clean seal up. I would definitely have a plan for gasoline-I have a 1.5 ltr gasoline jug that easily fits into my storage and gives peace of mind and enough miles to gas-the next Pemex in your case. Might take a look at how they're spread in Baja before leaving? And of course they are sometimes out of fuel IME. The siphon hose makes sense, not that I carry one. On my recent scooters 1st trip of 780 miles- half of my top case space was dedicated to layering gear to stay warm or dry-not your concern in Baja. The cat carrier had, the small gas jug, a pair of street shoes and flip-flops with some paper maps-only the flip flops got used. I use grocery plastic bags for a magazine, pills, zippy of dates, undies and socks. On a longer trip I'd have a purpose made bag on the pillion seat with more clothing. Tools I'd take on longer trips and know what fits and based on skill level. Short answer: fuel & tire stuff and a change of underwear & $$$. I wish you were taking ME along. That's what we call a "Ghetto Credit Card". Don't forget water...lots of water. That trip actually had less than my first week long trip and I’ve been working on cutting down what I take, learning what I never really use and telling my riding buddies they need to bring their own cameras and gear if they want video. I was carrying a lot of extra mounts and other stuff for the group. 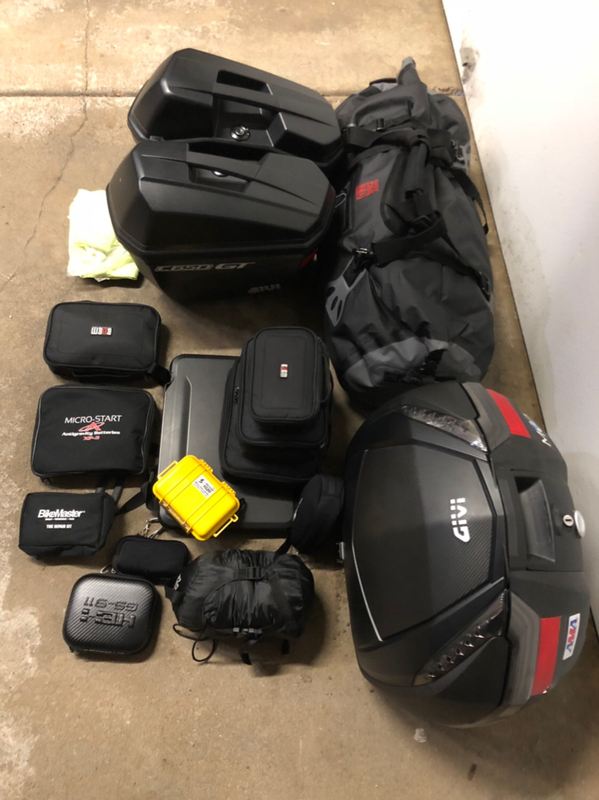 And the side cases that fit on the C650GT are only 22L so not that big or near as much as the 36-46L you can fit on a typical motorcycle side case. I'd add a small first aid kit (including the painkiller of your choice). Well since it looks like there's a 50/50 chance I'll be able to head back to Houston tomorrow I'm getting my bag ready. Besides appropriate riding gear I'll have a pair of comfortable pants and shoes for off the bike plus and extra 2 days beyond my planned ride time of socks/underwear. Probably 3 shirts and swimsuit since the hotel hot tubs sometimes call me.. As for the bike I'll top up the auto oiler, carry a tire kit and a small toolkit with the allen wrench sizes and the correct mm wrenches to tighten mirrors, etc just in case. Battery pack even though the bike has a power outlet for my phone/gps. Microfiber cloths for cleaning windscreen/mirrors/helmet visor. I also carry spare gloves since there is nothing worse that wet gloves IMHO. Beyond that AAA card, credit card and some cash. I am looking at a 5-8 day ride, maybe 50-50 hotels and staying with friends so need for camping gear, but why not! it is damm pretty down there, and getting stuck on a beach camping place is no problem with a scooter. Maybe this weekend will put thinkg in a bag and show you a pic or two, just to see how it looks and rides...so a Sunday local 150 mile ride will give me some info on what I like and what not. The first aid kit sounds good, hidra pack and an extra 1 liter of water, april is the time I will be getting out and about, (holly week or spring break, what ever it is call) so no real need for the big winter jacket, and gear. FWIW, a small first aid kit that includes a blood clotting pad lives under the seat of my scoots. It is just part of my normal kit like a small flashlight, tire gauge, spare gloves and spare sun glasses. I changed the belt before I left and packed the old one but if not I wouldn’t worry. A power pack to jump start might be nice but Baja is a lot friendlier than roadside US and if you’re stuck you’ll get a jump. A lot of mechanical problems are caused by overloading. Plus the ride isn’t as much fun. I have added a small travel sized spray btl of cleaner fluid for my visor to my travel kit. I copied the idea from Klaviator-often seen here on BS. I use a self mixed combo of dishsoap, alcohol and ammonia. It requires a small HF micro fiber towel for the job. BTW, they are great for travel, especially camping a s a small one can dry your whole body. I have never sprung yet for a battery pack but they are sold everywhere-even wally has several sizes. For my car & truck I prefer and old fashioned jumper cable as may need serious amps there. On my Vespa I can charge my phone and/or run my elec vest, both, while under way. If I had to buy all over again I'd look at battery clothing not sold back when I went to Gerbings jkt..
Baja is a much more welcoming place than the USA roadside wise, that we agree on. My GTS tool kit (all specifically chosen for this scoot!) fits in the palm of my hand and contained in a small canvas bag that I used for previous kits.